High School University (HSU) is the only magnet that does not have any required HSU-only course. In an effort to strengthen HSU’s identity, and enhance the curriculum, the Manual counselors are introducing an HSU required Freshman course tentatively called HSU Foundations. 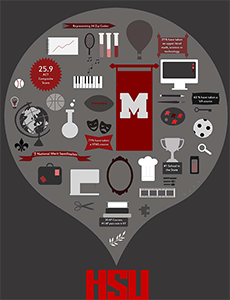 This course, based upon a review of many colleges’ liberal arts programs, would teach study habits, life skills, financial literacy, quantitative literacy, written and public speaking, global diversity, economics and an introduction to the arts and humanities opportunities at Manual. Freshman would rotate every six weeks. An advisory component will be included in the class. This class would begin in the fall of 2109 and would not be retroactive. Manual counselors are also slightly changing the HSU majors for more flexibility and the chance for students to create their own major. Students will now either have to take 3 AP courses or may take 4 courses from one of the career pathways offered at Manual. The career pathways are required to be offered by JCPS high schools. These changes would be targeted for implementation in the fall of 2019 and apply to current and future HSU students. These HSU enhancements were all developed by the counselors with the goal of helping Manual students be prepared for whatever they choose after graduation, as well as strengthening the HSU magnet. Feel free to contact your SBDM representatives if you have any questions or concerns.